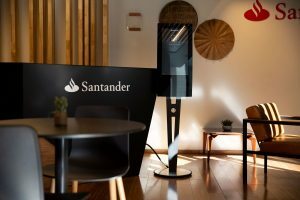 Zytronic has announced that its durable, high performance Multitouch Projected Capacitive Technology (MPCT™) touch sensors have been key to the transformation of Santander WorkCafé branches by the South American Customer Experience Specialist Company PX Group. The Santander WorkCafé, a one of a kind type of bank branch in Chile, turns a common branch into a community space: half bank and half café. It has now been implemented in 20 Santander branches, and is going forward to introduce 20 brand new offices by the end of 2018. 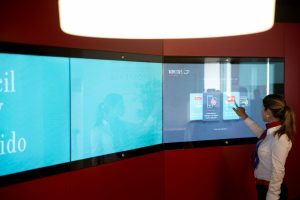 Zytronic touch sensors are integrated into the sign-in kiosk and video wall that is a central feature of each Santander WorkCafé. Customers and non-clients sign in using a PX Group D-One kiosk designed to welcome visitors to WorkCafé Santander rather than exposing a tedious barrier of admission. Customers interact with it using a 21” Zytronic multi-touch projective capacitive touch sensor. PX Group uses its Multimodal Biometric Access Profiler (MBAP) to control sign-ins. MBAP is an authentication system that eliminates passwords or secret questions and replaces it with more secure, seamless and convenient biometric data. An interactive video wall is a fundamental feature of each WorkCafé. The wall consists of four 55” screens presenting information including news, economic statistics, promotional material for Santander and other details. One of these displays features a 55” diagonal Zytronic touch sensor, operating through a protective toughened glass panel. WorkCafé Santander offices provide co-working spaces, a cafeteria and bank services, where clients and non-customers get free Wi-Fi, discounts in a high-end cafeteria, work tables, meeting rooms, state-of-the-art self-service technology, as well as the opportunity to discuss financial management with specialist relationship managers. Customers can self-manage interactions if they prefer, in a self-service zone offering quick and easy access to ATMs and deposit terminals.